COMPASSION: When Cesar was a teenager, he and his older sister, Rita, drove farm workers to the hospital when they were sick or injured. COLLABORATION: Cesar learned how to organize by training with the American community organizer Fred Ross. Ross also trained Dolores Huerta, who co-founded National Farm Workers Association with Cesar. RESPECT: Cesar eagerly supported movements led by other farm workers. In 1965, NFWA stood behind Filipino-American farm workers who initiated the Delano grape strike. NFWA organized a march from Delano to the state capitol in Sacramento. The strike lasted for five years and received national attention. Founding the National Farm Workers Association in 1962 (later known as United Farm Workers, or UFW). Best known Latino-American labor rights leader. Cesar Chavez was born into a large Mexican-American family in Yuma, Arizona. It was 1927, right before the Great Depression in the United States. His family owned a small grocery store. They lived on a ranch that his father earned by working in exchange for a house deed. But soon, the deal was broken. Cesar’s family lost their land. His father could not afford to buy it back. Forced to figure out a new plan, Cesar’s family moved to a barrio, or low-income neighborhood, in California. They became migrant workers and harvested produce all over the state. They picked peas and lettuce in the winter, cherries and beans in the spring, corn and grapes in the summer, and cotton in the fall. Cesar and his whole family, six brothers and sister, mother and father – sometimes slept in their car because they traveled so much. During this time, Cesar attended over thirty different schools. Every time his family moved, he and his siblings were new students all over again. He experienced what it was like to feel different. Some schools even segregated hispanic students from white students. Racism made it hard for Cesar to feel welcome at school. He decided that seventh grade would be his last year of formal education, and that he would help support his family as a farm worker. Cesar soon realized there was a lot of injustice for farm workers. Farm workers made very little money, worked in unsafe conditions, and were often abused by their employers. They usually did not have proper health care, worked very long hours, and with harmful chemicals. Cesar wanted to help. He learned about community organizing and encouraged Mexican Americans to vote. He made speeches supporting workers’ rights, and he decided to create a labor union to advocate for workers like him and his family. In 1962 he co-founded the National Farm Workers Association with famous civil rights activist Dolores Huerta. (It was later known as United Farm Workers, or UFW.) Dolores and Cesar hoped to unite farm workers to peacefully demand better treatment. One way that United Farm Workers created change was by supporting worker strikes. During a strike, workers agreed not to do their jobs until conditions improve. By standing together they were able to gain the attention of their employers. Another way Cesar brought recognition to the cause was by fasting, or publicly refusing to eat. 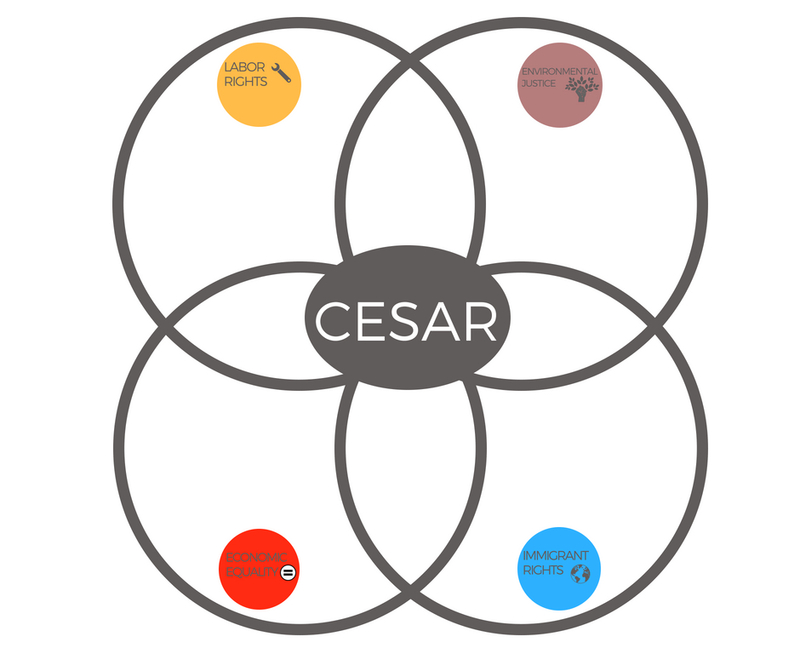 Cesar also encouraged people in the US to boycott – not buy – grapes until farm workers got paid a better wage. UFW supported movements led by workers of different races and backgrounds. With the help of his community, Cesar created big changes for farm workers by never giving up, using peaceful protests, and uniting communities with a common cause. U.S. GOV Standard 2.3: Students will explain the purpose and importance of fulfilling civic responsibilities, including serving on juries; voting; serving on boards, councils, and commissions; remaining well-informed; contacting elected officials; and other duties associated with active citizenship. U.S. II Standard 5.1: Students will investigate how individual and institutional decisions made during the 1920s, such as over-production, buying on credit, poor banking policies, and stock market speculation helped lead to the boom of the 1920s and then the Great Depression. Objective: Students will consider the human(s) who helped grow and distribute the food they eat. They will discuss their needs and desires. Finally, they will create a policy, an action, or a tool that would possibly improve this person’s life. Tell students that at least one person helped harvest this item of food for them. In fact, many hands went into the preparation and distribution of this food, from the time it was planted to the time it arrived to their homes in their refrigerators. Ask them to imagine one person in this process – was it the person who planted it? The person who watered it? Who picked it? The person who packaged it? The one who drove the truck? When they have the person in mind, imagine their face. Then, decide upon an imaginary name for this person. Write their name down on a piece of paper. What or who does this person care about? Why is this person working this job? What would this person rather be doing? Put students into pairs to share their journals/drawings and answer the questions above. To keep them on track, give 2-3 minutes for each question and ring a bell between. What are this person’s biggest needs? If students want to create a tool, give them modeling clay, recycled materials, pencils, and paper to design and build a tool that would improve the life of a migrant worker. If students want to create a policy, have them imagine they are a politician or lobbyist drafting a proposal to submit to legislators. If they are organizing a nonviolent action, have them write a speech to encourage support and participation from their fellow farm workers. Have them consider how their action would disrupt economic trade and gain public buy-in. Chicano! PBS Series: The Struggle in the Fields: Focuses on Chavez’ involvement in the California Boycotts and contextualizes his work within the greater NFWA/UFW movements. 53 min. 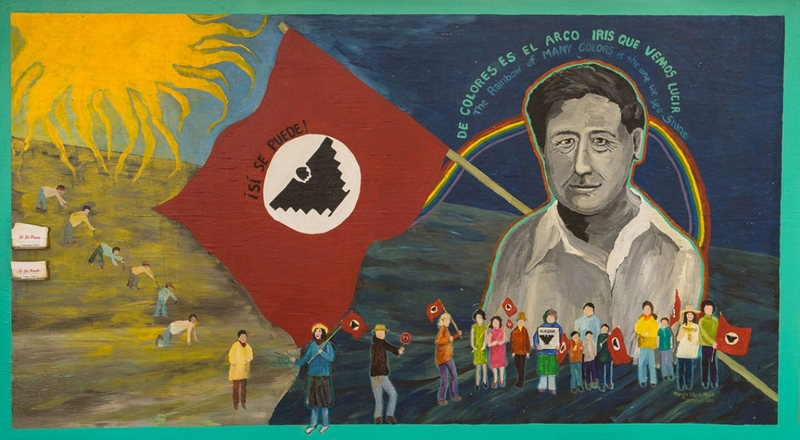 ITVS (Independent Television Service): The Fight in the Fields: Cesar Chavez and the Farmworker’s Movement: A historical review of United Farmworkers Union (UFU), activist Cesar Chavez, and the nonviolent measures taken by the movement as a whole from NFWA to UFW. 117 min. Cesar Chavez to UCLA, October 11, 1972, 42 min. The fight in the fields, 15 min.